The term family office can refer to a family controlled investment group, and also the two major terms: single family office (SFO) or multi-family office (MFO). The distinction is important since, despite the similar names, they provide significantly different services. This article refers principally to single family offices, which are the predominant forms of family offices today. An SFO is a private company that manages investments and trusts for a single family. The company's financial capital is the family's own wealth, often accumulated over many family generations. Traditional family offices provide personal services such as managing household staff and making travel arrangements. Other services typically handled by the traditional family office include property management, day-to-day accounting and payroll activities, and management of legal affairs. Family offices often provide family management services, which includes family governance, financial and investment education, philanthropy coordination, and succession planning. A family office can cost over $1 million a year to operate, so the family's net worth usually exceeds $100 million in investable assets. Recently, some family offices have accepted non-family members - typically starting with a club investment structure. These hybrid family offices fall between a pure single family office & a traditional multi family office setup. According to The New York Times the Rockefellers first pioneered family offices in the late 19th century. Family offices started gaining popularity in the 1980s, and since 2005, as the ranks of the super-rich grew to record proportions family offices swelled proportionately. A traditional single family office is a business run by and for a single family. Its sole function is to centralize the management of a significant family fortune. Typically, these organizations employ staff to manage investments, taxes, philanthropic activities, trusts, and legal matters. The purpose of the family office is to effectively transfer established wealth across generations. The family office invests the family's money, manages all of the family's assets, and disburses payments to family members as required. The Family Office Council, the membership group for single family offices, defines a single family office as "An SFO is a private organisation that manages the investments for a single wealthy family. The assets are the family’s own wealth, often accumulated over many family generations. In addition to investment management some Family Offices provide personal services such as managing household staff and making travel arrangements. Other services typically handled by the traditional Family Office include property management, day-to-day accounting and payroll activities, and management of legal affairs. 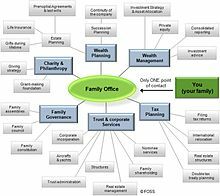 Family Offices often provide family management services, which includes family governance, financial and investment education, philanthropy coordination, and succession planning." Assists in the financial oversight of all liquid financial assets. Assists in the daily management of all illiquid assets, such as real estate. Assists in the administration of the family estate with little to no supervision. In 2016 single family offices are in a state of transition largely because the founding patriarch/matriarch is aging or deceased. The next generation often finds the costs to maintain the office prohibitive. New models are emerging, including the virtual family office. Family offices in the United States are politically active, making campaign contributions to many candidates and PACs on both sides of the aisle. They use sophisticated tax avoidance techniques which can reduce the tax burden, at least in the United States, considerably. The Private Investor Coalition, an association of family offices, lobbies the U.S. Securities and Exchange Commission for favorable rulings. Allies such as the Managed Funds Association, an association of hedge funds, actively lobby the United States Congress to preserve and expand provisions which allow tax avoidance. Some have argued that a reduction in agency funding as a result of the IRS targeting controversy has limited government efforts to examine the income tax returns of wealthy families, and entities controlled by them via the Global High Wealth Industry Group. Under the Dodd-Frank Wall Street Reform and Consumer Protection Act, an organized effort was undertaken by single family offices nationwide led by the Private Investor Coalition that successfully convinced Congress to exempt SFO's meeting certain criteria from the definition of investment adviser under the Investment Advisers Act of 1940 (previously, such family offices were deemed to be investment advisers and relied on the "less than 15 clients" rule to avoid registration under the Act, a rule that was eliminated under Dodd-Frank). The Securities and Exchange Commission (SEC) promulgated the final "family office rules" on June 22, 2011. ^ Douglas, Craig M.; Todd Wollack (2007-06-08). "Case highlights family office risk". Boston Business Journal. Retrieved 2007-06-27. ^ Frank, Robert (2004-06-10). "How to Bank Like a Billionaire". The Wall Street Journal. Dow Jones. Retrieved 2007-06-27. ^ Wakem, Maria (2005-03-22). "Family Matters". wallstreetandtech.com. Retrieved 2007-06-27. ^ a b Noam Scheiber and Patricia Cohen (December 29, 2015). "For the Wealthiest, a Private Tax System That Saves Them Billions The very richest are able to quietly shape tax policy that will allow them to shield billions in income". The New York Times. Retrieved December 31, 2015. ...tax planning is a core function. ^ "Defining 'Family Office'". Familyofficecouncil.com. 2013-09-15. Retrieved 2016-01-15. ^ Opalesque (30 April 2010). "Opalesque BACKSTAGE Video-Terry Beneke: What attracts family offices to alternative investments". ^ Milburn, Robert (2008-12-16). "Mr. Freud in the Family Office - Penta Daily - Barrons.com". Blogs.barrons.com. Retrieved 2016-01-15. ^ Gardner, Scott (2010-11-14). "Sterling Wealth Management - Family Offices Abound" (PDF). www.sterlingwealth.net. Scott Gardner, President. Retrieved 2016-01-15. ^ "SECURITIES AND EXCHANGE COMMISSION : 17 CFR Part 275: [Release No. IA-3220; File No. S7-25-10]" (PDF). Sec.gov. Retrieved 2016-01-15.